Whatever access control system you select for your business, you want to know that you’ve selected a vendor that can both install and repair these systems, that is bonded and insured, and that employs expert technicians that provide quick service at affordable prices. There was a time when a security system for a business consisted simply of a key and a lock but for many companies, those days are long gone. Many businesses use a local DC commercial locksmith to install and repair their security systems such as CCTV systems. One of the most popular requests we receive is for access control systems. These systems can come in many forms, from complete systems spanning a building to individual components, ranging from numeric keypads to magnetic cards. Whatever access control system you select for your business, you want to know that you’ve selected a vendor that can both install and repair these systems, that is bonded and insured, and that employs expert technicians that provide quick service at affordable prices. The many federal agencies with offices in Washington DC and surrounding areas have security systems in place to protect their work. If your business needs a new access control system or if you need to repair existing access control systems, call DC Local Locksmith Experts. As our name indicates, we are a complete locksmith service in Washington DC and surrounding areas. All of our technicians have at least 5 years’ experience, and our fast and friendly staff will help you resolve your security needs quickly and efficiently. Some locksmith services will provide a quoted price for work, going to great pains to point out that such a quote is free. After a job is completed, however, they more than make up for such generosity by providing customers with an inflated bill that far exceeds the original quote. At DC Local Locksmith Experts, our upfront pricing policy means that our original price is the price that you will pay. Moreover, other locksmith companies keep 9-5 hours or if they offer an emergency service, they never seem to be around when trouble happens. Or if you can reach them, they want you to drop the problem off at their office. DC Local Locksmith Experts, on the other hand, offers 24-hour locksmith service in DC with mobile locksmiths and a 30 minute response time to resolve your issues with the minimum amount of inconvenience to you. There are several reasons why installing an access control system in your building makes a lot of sense. You may have felt secure for years with a lock and key system. But how many employees or contractors have misplaced or lost keys over the years? How much time and expense has been spent replacing them? And simply replacing keys does nothing for business, employee, or visitor safety. Those missing keys could have been “found” by the wrong person! You can circumvent this by replacing locks. But replacing locks throughout an entire building, again and again, can prove very expensive. And if employees decide to save time by leaving doors unlocked or propped open, your building’s security efforts are rendered moot. Access control systems are an excellent option for businesses that need to keep certain areas or rooms private, restricted only to certain employees. 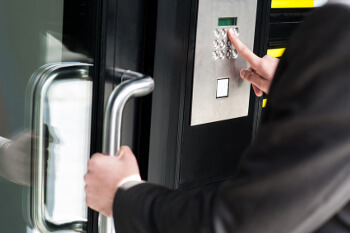 The benefits of installing access control systems for your business are many. Instead of trying to track many keys in many hands, access into and throughout the building is regulated by electronic locks. If access cards are lost or stolen, the chips can easily be reprogrammed to refuse further building access. Likewise, if an employee is terminated and does not relinquish his or her card, the card can be reprogrammed to deny access. And not all employees may be permitted access to all parts of a building. An access control system can effectively keep all employees where they’re supposed to be. Systems can be customized to fit various businesses, and generally fit within the stand-alone (magstripe and PIN code activated) and PC controlled (the system is directly controlled from office computers) options. Take advantage of DC Local Locksmith Experts’ complete locksmith service, which includes upfront pricing, 24/7 locksmith service for all of your security needs, and experienced technicians who can install and repair access control systems quickly and professionally. Call us today, and let us help you make your dreams for an access control system in your building a reality. Access Control Systems https://dclocallocksmith.com/commercial-locksmith-dc/access-control-systems-dc/ 4.0/5 based upon 8 reviews.